Get your hands on Psycho Holiday, which features my story, Blossom. my story, Raven's Revenge, has also been brought to life...Be sure to check it out! Order Hell's Heart, which features my story, Burning Love. The anthology is also available on Smashwords. Real American Horror is now available, featuring my story, Initiation Day. Check out Deadman's Tome Campfire Tales Book Two, featuring my story, Crosshairs. Get your paws on Hell's Kitties, featuring my story, Bruised and Battered Nevermore. Order Tales from The Lake Vol. 3, featuring my story, The Bet. 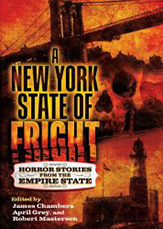 Check out Fright Mare at Amazon, featuring my story, Snow Angel. Also for Kindle. Download Hell's Grannies: Kickass Tales of the Crone for Kindle, featuring my story, Fresh Finch. Also via Smashwords. My book of crime stories, Rage and Redemption in Alphabet City, has just been published by New Pulp Press! Snag your copy at Amazon.com, Barnes & Noble, Kindle, Kobo, and Walmart. Check out my tale, Sorry Charile, over at Close to the Bone! Expiration Date, featuring my story, Ashes to Ashes, is available at Amazon and also for Kindle! Shrieks and Shivers from the Horror Zine, featuring my short story, Rampart, has been unleashed. Dead Harvest, featuring my short story, Crosshairs, is available at Amazon. Get yours today!